New, updated and expanded training materials on important laws and requirements that directly impact freight brokers! Completely new section on powerful section on search strategies to uncover customers. Go where no one else is going and leave the competition in the dust. 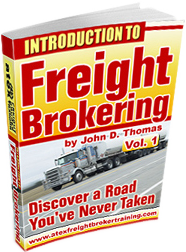 Learn how to broker freight in a matter of weeks – and you don’t have to spend thousands and thousands of dollars doing it! This program is sent in eBook format and includes a comprehensive, step-by-step 5-Part training manual, about 40 handouts and over 18 video presentations. You have about 12 hours (as a guide) of formal, one-on-one training after which you have unlimited support via telephone or email. There are no refunds for materials or training. Training manual will not work on MACs.